This puzzled a lot of people. However, the reason is very simple: to save cost. USB 3.0 cable probably will cost Samsung $0.25-$0.6 more. 100 million Galaxy S5 means about 25-60 million dollars more profit. In Galaxy Note 4, USB 3.0 support is totally removed. Return back to USB 2.0. This probably saves Samsung a few dollars each device (cable, connector, chips and other materials). Business is about making profit. But if Samsung tries to save cost with such older (still usable) technology, it seems Samsung has a wrong positioning of Galaxy Note devices. Galaxy Note device is not just a bigger Galaxy S device with a tail. It should reflect Samsung’s ambition of making the best smartphones with cutting-edge technologies. Although some may argue USB 2.0 is still universal and the cable can be easily found, USB 3.0 is backward compatible with USB 2.0. The USB 2.0 cable can always be used when you cannot find an USB 3.0 cable. Samsung understands the importance of the exterior (who don’t?). 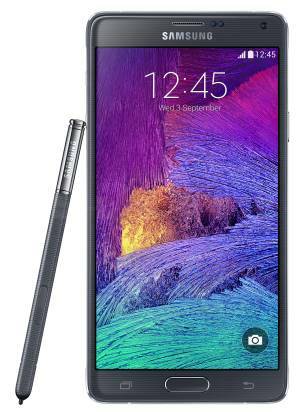 Galaxy Note 4 uses metal frame and faux leather (just another name of plastic). Does metal frame make Galaxy Note 4 premium? Probably, yes for some people. Does faux leather make Galaxy Note 4 premium? Probably, no for most owners. If premium is the objective, why not genuine leather as in Moto X? However, the soft touch faux leather does provide better grasp than metal or the dimpled plastic. So, Samsung is trying to make Galaxy Note 4 premium. But they want to cut corners, instead of making it really premium. At least Motorola successfully makes genuine leather for Moto X 2nd generation. There should be no technical problems for Samsung (with own big manufacturing operations) to offer genuine leather for Galaxy Note 4, instead of the “Faux leather”. Saving cost probably is one major concern. Another deeper problem is that today’s smartphone users are not just looking for “premium”. Some are looking for customization. What Samsung offers for Galaxy Note 4 is black or white colors. Surely, a few other colors including gold will come soon when the initial sales momentum diffuses away. Samsung never tried to offer something comparable to Moto Maker from Motorola, who is not big enough to shake the market and mistakenly offered it only in US for last years’s Moto X.
Samsung tries hard to maintain the leading position by offering conventional stuffs, instead of creating a new market. Among all Android vendors, Samsung is in the best position of experimenting innovative stuffs to strengthen their leading role: Galaxy S series for the mass market; Galaxy Note series for tech enthusiasts and niche market. But the unexpected success of Galaxy Note series apparently makes Samsung confused on the positioning of Galaxy Note phones. It becomes an intermediate products between two generations of Galaxy S.
Bigger screen and the tail (S Pen) become the only differentiators. I am not talking about the Gapgate, which is inherent of the design. Samsung is probably correct: it is not a manufacturing defect. But it is a design defect. The bigger issue for the design of Galaxy Note 4 is the lack of water resistance. Although there are some complaints on water resistance in Galaxy S5, it will gradually become an expected feature for high-end smartphones. One acceptable excuse is the presence of S Pen. But, I don’t think there are no feasible solutions. The S Pen itself can be designed to seal the S Pen holder. Rear -facing speaker is still very common in smartphones. But it is the comprise of the old designs. It is probably the worst design when sound quality (not loudness) is concerned. HTC has proven the superiority of the front facing speakers. Motorola also uses front-facing speakers in the $129 Moto E, Moto G 2nd Gen and Moto X 2nd Gen.
Galaxy Note 3 moved the speaker to the bottom. At least it is a better location than in the back. Now in Galaxy Note 4, the design went back to the stone age: the similar location as that of its grand-grandfather-Galaxy Note 1. The quality of the the speaker is apparently not so good either. An acceptable excuse is space limitation. But the real problem is design. One of the advantages of Android is that all vendors can customize it. Gradually, however, this becomes the disadvantage: inconsistent user experience, resource hogging and slow update. In Galaxy Note 4, the Samsung TouchWiz looks still unwieldy. Some cosmetic makeover and latest hardware does alleviated this issue to certain extent. Apparently, a deep optimization is desperately needed for TouchWiz. Relying on top-notch hardware, instead of optimizing and polishing the code, is not the correct approach for an industry leader. If you check the storage, you will find the Galaxy Note 4 requires 7.3-7.6GB for the system (without carriers’s bloatware) . This is higher than almost all other Android phones. S Pen feature may require additional space, but it should not need that much. The reinvented wheels should be removed. Galaxy Note 4 is a great smartphone. But Samsung is apparently losing momentum of embracing cutting edge technologies in Galaxy Note phones. This will send Galaxy Note series into a vicious cycle: cutting corners -> less competitive -> cutting corners further, if Samsung fails to re-position Galaxy Note phones and to differentiate Galaxy S and Galaxy Note devices. What do you think about Galaxy Note 4 defects? Share with the community in the comment box below. Brand new ATT Galaxy Note 4 — whenever camera is used, first 30 seconds to 1 minute the image is extremely blurred. I touch a small region of the screen and wait a few seconds, and touch a different part etc. Eventually, the camera somehow goes into extremely good focus. After this, any pictures and video are very nicely focused. Why is there this bug for the first minute or so? Is there a more deterministic way to make the camera “learn” to focus more quickly? I didn’t heard about this problem before. You may check with Samsung service centre. Did you try to reset the camera settings? Tried safe mode — same problem. Tried Google Camera (instead of default camera from Samsung) — problem remains. Googling for issue shows others have this problem too — it is some hardware bug/defect. Thank you for the update. The problem may be affect some batches of the hardware. My major complaint is that you don’t receive text notifications when you are in the text thead. If I’m typing a response text, I never know of the other party has sent an additional text message. That along with you is my biggest irritation! Anyone figure out a way to fix it yet? After using note 4 nearly a month I got problem such as lagging and hanging sometimes. In addition note 4 is not working properly with swype dragon keyboard, which I like very much. To avoid this problem I have to use Samsung default keyboard. Lagging is seldom reported. You may try to disable battery saving mode of you enabled them before. For the keyboard, you may try SwiftKey. Agree with yoy about rear facing speaker. I have a note pro 12.2 with stereo speakers on wach5 side of the screen and putting a small speaker on the rear is so backward. Thank you for your input. Note Pro got decent speakers. In all previous Note devices, the original Galaxy Note 10.1 has dual front facing speakers. And it looks also very nice (although the quality of the speaker probably is not as good as that in Note Pro). But unfortunately, Samsung stops putting speakers in the front panel in tablets. The space definitely is not an issue for the large bezel in tablets. The major reason I heard is design and manufacturing consideration. They are trying to save every $0.000001. I also agree with the speaker comment… I do not want my phablet… which I bought for business use to have speakers on the front. In my opinion, front speakers on a large phone make it look like a “boom box” from the 80’s. I want it to look professional… not like a toy. As a stereo buff as well, no matter how good we may want the speakers sound on the front of a phone… they will never sound like a great sound system… or as good as headphones. As phones are a matter of preference… I believe the note for was not made to cater to the professional side of things… business, photo, and web…. and not as much to gaming and sound. For that purpose, it does a fantastic job. I believe the Note was made to cater. The word NOT needs to be removed. Totally agree with David. Calling any of these “defects” is just fishing for clicks. And further, the USB 3.0 support was awful on the Note 3. It disabled calling, hellooooo its a phone. I’d rather have a feature that works. If it can’t work, leave it out till its sorted. Thank you for the input. Defect does not necessarily means hardware quality. What I mean is the design or planning defects, not about manufacturing. For example, the water resistance probably should have been be considered in planning the phones. For USB 3.0 support on Note 3 and S5, I didn’t face any issues after updating Kies 3. I don’t think it disables calling. There were some other problems only when Note 3 was initially released. I think Samsung fixed the bug within about 2 months or something. If you are still facing problems with USB 3.0, you may try to update Kies 3. I got my Note 4 on Friday. All of your “defects” are nothing but pet-peves. I’ll give you that the TouchWiz is a pain most of the time. But I also have an HTC One M8 and I’d prefer the TouchWiz over what’s on it any day. My new Note 4 has been awesome. I charged it Saturday from about 35% to 94% in less than an hour. That was awesome. Plenty of speed and plenty of wonderful pictures. The screen looks great. And the “freebies” that were tossed in the software from Samsung were a plus. If I wanted waterproof I’d either but a good case or a phone that is waterproof. This isn’t a defect. It’s a feature you wanted but wasn’t there. Customization? Buy a case. You can then change it out as the mood hits you. Rear facing speaker an issue? I just want to hear my phone ring so I don’t miss a call. When I play music or watch video, I’m polite and plug in a headset. The audio quality if pretty good for me then and I’m not being rude to those around me.